Hello, my name is Michael. Welcome! 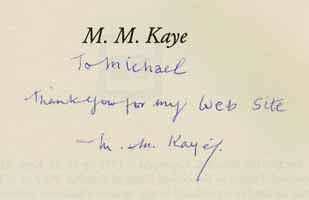 This extensive, 79 page, website (best viewed using Google Chrome) is dedicated to the life and work of M M Kaye. My primary aim is to provide as much information about this remarkable author and artist as possible. To this end, I have included a definitive Bibliography page plus dozens of web pages displaying book covers from around the world for those interested in seeing how Mollie's books have been exploited in different parts of the globe. This is more important than ever now that Mollie's books are currently out-of-print in many countries. I have also included interviews, book reviews, numerous biographical articles and synopses of her out-of-print children's books. Examples of Mollie's sketches, illustrations and watercolours can be found via the Illustrations and Paintings menu. I would like to take this opportunity of thanking M M Kaye and her family for their support and generous donation of over 100 foreign language editions of her books for use on this website. If you happen to have different book covers to the ones displayed and are willing to have them posted on this website for others to enjoy, then please send your scans to me via the e-mail link. Thank you. M M Kaye may be the only author in the family but she is certainly not the only artist in the family. Indeed, the love of painting has permeated through four generations of the Kaye family: from the delicate watercolours of Mollie's mother, Lady Daisy Kaye, to the pastel portaits of her sister Betty Kaye; to Mollie's daughter Carolyn Bachman who works in a variety of mediums including oils, watercolours and sculpture. M M Kaye's grand-daughter and Carolyn's daughter, Mollie Bachman, is the latest member of the family to pick up a brush and has chosen acrylics as her preferred medium. A selection of paintings from each generation can be accessed via the Illustrations and Paintings section of this website. If you have any paintings from any members of the Kaye family and are willing to have them displayed on this website for others to enjoy, then please send your scans to me via the e-mail link. Thank you.